Background: Sahaja Yoga is a traditional system of meditation based on yogic principles which may be used for therapeutic purposes. A study was undertaken to assess the effectiveness of this therapy as an adjunctive tool in the management of asthma in adult patients who remained symptomatic on moderate to high doses of inhaled steroids. Methods: A parallel group, double blind, randomised controlled trial was conducted. Subjects were randomly allocated to Sahaja yoga and control intervention groups. Both the yoga and the control interventions required the subjects to attend a 2 hour session once a week for 4 months. Asthma related quality of life (AQLQ, range 0–4), Profile of Mood States (POMS), level of airway hyperresponsiveness to methacholine (AHR), and a diary card based combined asthma score (CAS, range 0–12) reflecting symptoms, bronchodilator usage, and peak expiratory flow rates were measured at the end of the treatment period and again 2 months later. Results: Twenty one of 30 subjects randomised to the yoga intervention and 26 of 29 subjects randomised to the control group were available for assessment at the end of treatment. The improvement in AHR at the end of treatment was 1.5 doubling doses (95% confidence interval (CI) 0.0 to 2.9, p=0.047) greater in the yoga intervention group than in the control group. Differences in AQLQ score (0.41, 95% CI –0.04 to 0.86) and CAS (0.9, 95% CI –0.9 to 2.7) were not significant (p>0.05). The AQLQ mood subscale did improve more in the yoga group than in the control group (difference 0.63, 95% CI 0.06 to 1.20), as did the summary POMS score (difference 18.4, 95% CI 0.2 to 36.5, p=0.05). There were no significant differences between the two groups at the 2 month follow up assessment. Conclusions: This randomised controlled trial has shown that the practice of Sahaja yoga does have limited beneficial effects on some objective and subjective measures of the impact of asthma. Further work is required to understand the mechanism underlying the observed effects and to establish whether elements of this intervention may be clinically valuable in patients with severe asthma. There is a long history of psychosomatic theories for the aetiology of asthma1 and of investigations into the role of anxiety and emotional states in outcomes of the disease.2 Various psychological interventions have been implemented in patients with asthma. At least one trial of hypnosis has yielded a positive result,3 but relaxation alone was not effective in a recent trial.4 Buteyko breathing, a method of controlled breathing, has recently attracted attention in Australia and some preliminary evidence suggests that it may have beneficial effects.5 Singh et al6 have shown that regular use of a device which slows breathing and changes the ratio of inspiratory to expiratory time, in a manner equivalent to pranayama yoga breathing methods, decreases airway hyperresponsiveness (AHR) in asthmatic subjects. The optimal management of patients with asthma who remain symptomatic on moderate to high doses of inhaled steroids remains undefined. Pharmacological alternatives include further increases in the dose of inhaled steroids, addition of long acting β2 agonists,8 or introduction of leukotriene receptor antagonists.9 The role of non-pharmacological therapies, including psychological and physical techniques, in this context has not been well established to date. We sought to assess the effectiveness of a non-pharmacological intervention, Sahaja yoga, as an adjunctive tool in the management of asthma in adult patients who remained symptomatic on moderate to high doses of inhaled steroids. In particular, we examined its effect on asthma related quality of life, mood state, level of airway hyperresponsiveness, and a diary card based score reflecting symptoms, bronchodilator usage, and peak expiratory flow (PEF) rates. A parallel group, double blind, randomised controlled trial was conducted. After a 2 week baseline assessment period, subjects were randomly allocated to Sahaja yoga and control intervention groups. Both the yoga and the control interventions required the subjects to attend a 2 hour session once a week for 4 months. Subjects were informed that the project aimed to assess the relative effectiveness of two alternative relaxation techniques for the management of asthma. Outcome assessments were undertaken at the conclusion of the 4 month intervention period and again 2 months later. Allocation to groups was by randomised permuted blocks with a block size of four. The allocation for each successive subject was contained within a sealed envelope. The study protocol was approved by the Institutional Ethics Committees of the South Western Sydney Area Health Service and the Central Sydney Area Health Service. Informed consent was obtained from subjects prior to randomisation. The aim was to select adult patients with asthma who remained poorly controlled on moderate to high doses of inhaled steroids and who were amenable to the idea of a non-pharmacological stress management intervention. Subjects were recruited by newspaper advertisement (n=850 responses), review of asthma clinic records (n=200 reviewed), and through local general practitioners (n=30 referrals). Subjects with asthma were eligible for inclusion in the study if they were aged 16 or over and had a history of asthma symptoms for a least 1 year. Other inclusion criteria were: at least moderate to severe asthma as evidenced by a combined asthma score of 7 or more out of 12 (see below)10; airway hyperresponsiveness (PD20FEV1 <12.2 μmol methacholine) or >15% FEV1 bronchodilator response; daily inhaled treatment with ≥1500 μg beclomethasone, 1200 μg budesonide or 750 μg fluticasone for at least the preceding 6 weeks; and stable asthma treatment for the preceding 6 weeks. Subjects with a history of an exacerbation or respiratory tract infections in the preceding 6 weeks, current smokers, pregnant or lactating women, and those who could not communicate in English were excluded. The key experience of Sahaja yoga meditation is a state called “thoughtless awareness” or “mental silence” in which the meditator is fully alert and aware but is free of any unnecessary mental activity. The Sahaja yoga session was conducted by an experienced instructor who taught subjects how to achieve this state by the use of silent psychological affirmations. The weekly sessions involved meditation, instructional videos, personalised instruction, and discussion of problems in relation to improving the experience of meditation. Subjects were encouraged to achieve this state of mental silence for a period of 10–20 minutes twice each day. The control intervention included relaxation methods, group discussion, and cognitive behaviour therapy-like exercises. Relaxation methods involved positive affirmations such as “I can breathe easily and without restriction”, progressive muscle relaxation, and visualisation (focusing on seeing their lungs breathing easily). Group discussion was semi-formal and enabled participants to share experiences and develop a sense of community. The cognitive behaviour therapy-like exercises were designed to give the subject insight into the way in which their thoughts, feelings, and reactions to stress influenced the severity and perception of their illness. This approach was based on a workbook on relaxation and stress management techniques called Learning to Unwind.11 The sessions were conducted by an experienced instructor. Subjects were encouraged to practise the techniques at home for 10–20 minutes twice daily. Both the yoga and control techniques were practised with the subject seated. Treatment with inhaled steroids, long acting β2 agonists, and/or theophylline was continued unchanged throughout the study period. Outcome assessments at baseline, at the end of the intervention, and 2 months after the end of the intervention were undertaken by an investigator who was blind to the group allocation of the subjects. Subjects kept written diary cards to record twice daily PEF rates, symptoms, and bronchodilator use for 2 week periods at each assessment. Each of these was scored as shown in table 1. The combined asthma score,10 the sum of these three components, was then calculated for each subject for each assessment period. The possible range of scores was 0–12. In addition, mean morning peak flow (am PEF) and lowest peak flow as a percentage of the highest peak flow (low%high) were calculated for each diary card. At each assessment subjects completed a questionnaire to assess changes in medication compared with baseline. A disease specific asthma quality of life questionnaire (AQLQ, University of Sydney)12 and a measure of mood states, the Profile of Mood States (POMS),13 were also administered. Total AQLQ scores and subscale scores for breathlessness, mood disturbance, social disruption, and concerns for health were calculated on a scale of 0 (no impairment of quality of life) to 4 (maximum impairment). POMS scores for tension, depression, anger, vigour, fatigue, confusion, and a summary mood score were calculated. Spirometric function was measured at least 4 hours after the last dose of short acting bronchodilator and 12 hours after the last dose of long acting bronchodilator. A methacholine challenge test was performed to assess airway responsiveness in subjects who did not have severe airflow obstruction (generally, FEV1 >60% predicted14) at baseline. The challenge was performed by the rapid method using a hand held DeVilbiss No 45 nebuliser to administer cumulative doses of methacholine in the doses of 0.1–12.2 μmol.15 The provoking dose required to cause a 20% reduction in FEV1 from the post-saline value (PD20FEV1) was measured by linear interpolation on a log-dose response curve or by linear extrapolation to a maximum of twice the final dose administered. All extrapolated values greater than this were assigned a value of twice the final cumulative dose. Values of PD20FEV1 were log transformed for analysis. Change in PD20FEV1 was expressed in units of doubling doses. Analysis was by intention to treat. Primary outcome variables were the combined asthma score, the AQLQ (Total) score, and PD20FEV1. All other outcomes were secondary outcome variables. All outcomes measured at the conclusion of the intervention and 2 months later were expressed as changes from baseline. Between group differences in these changes were calculated, together with 95% confidence intervals. The changes were compared by the unpaired (two sample) t test. For non-normally distributed data Wilcoxon's non-parametric test was used to check the results of the parametric analysis. Details of subjects' record of attendance at the Sahaja yoga and control group sessions were quantified to assess compliance. We estimated that a sample size of 25 in each group would allow us to detect a difference between groups in PD20 of one doubling dose with 80% power (α = 0.05). This sample size would also be sufficient to detect a clinically meaningful difference in AQLQ scores between the groups.16 To ensure 25 subjects were available for evaluation we planned to randomise 30 subjects into each group. Of 120 subjects who appeared suitable for the study on the basis of initial telephone interview, 59 eligible subjects were finally randomised: 30 to the Sahaja yoga intervention and 29 to the control arm. Nine subjects randomised to the yoga intervention and three subjects randomised to the control group withdrew before the end of treatment assessment. No outcome data are available for these subjects. The reasons for withdrawal are shown in table 2. Differences at baseline between the randomisation groups and between those who did and did not complete the end of treatment assessment are shown in table 3. Subjects in the yoga group had slightly higher (worse) scores on the mood subscale of the AQLQ and higher PEF values (low%high) than those in the control group. Five subjects in each group were using long acting β2 agonists and one subject in each group was taking theophylline. Of the 21 subjects in the yoga group who had the end of treatment assessment, five did not have a methacholine challenge at baseline (all because of a pre-test FEV1 of <60% predicted), four did not have a challenge at the end of treatment (two because of a pre-test FEV1 of <60% predicted), and six did not have a challenge at end of the 2 month follow up period (four because of a pre-test FEV1 of <60% predicted). Of the 26 control group subjects who had the end of treatment assessment, one was lost to follow up before the 2 month follow up assessment and one did not complete the diary cards or questionnaires at the end of the treatment period or the 2 month follow up period. In addition, seven did not have a methacholine challenge test at baseline (six because of a pre-test FEV1 of <60% predicted), eight did not have a challenge at the end of the treatment period (seven because of a pre-test FEV1 <60% predicted), and nine of the continuing participants did not have a challenge at the end of the 2 month follow up period (eight because of a pre-test FEV1 of <60% predicted). Twenty of the 21 subjects in the yoga intervention group who had the end of treatment assessment attended at least eight of the 16 yoga sessions. Seventeen of these attended 12 or more sessions and five attended all 16 sessions. In the control group 19 of the 26 who had the end of treatment assessment attended at least eight sessions, 17 attended 12 or more sessions, and 12 attended all 16 sessions. At the end of the treatment period the level of AHR had improved by 1.6 doubling doses (95% confidence interval (CI) 0.6 to 2.7) in the yoga intervention group and by 0.2 doubling doses (95% CI−0.8 to 1.2) in the control group (p=0.047 for between group difference). The difference between the groups was no longer significant 2 months after the end of treatment (fig 1, table 4). Changes in airway responsiveness to methacholine. 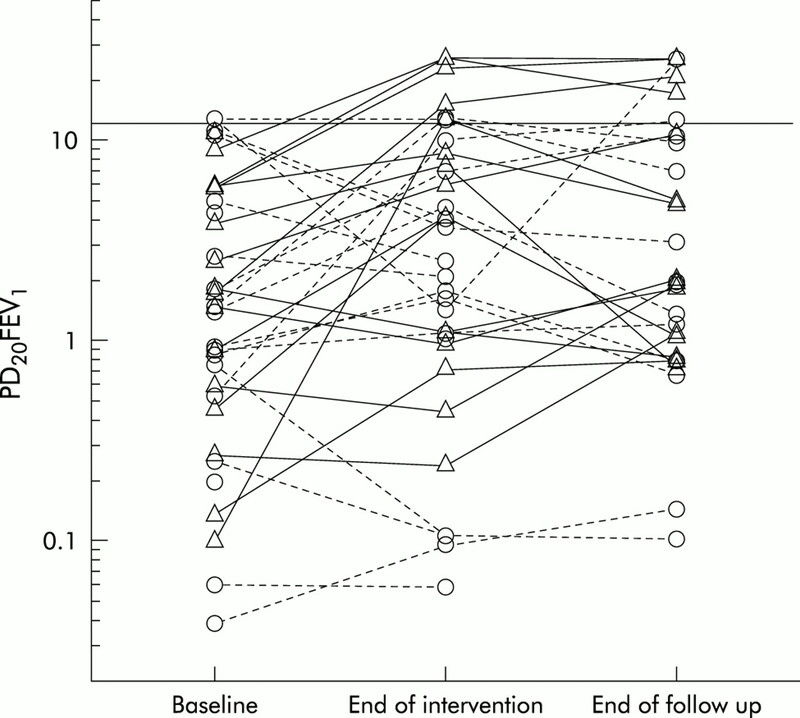 PD20FEV1 (μmol methacholine) at baseline, at the end of the intervention, and 2 months after the end of the intervention in the yoga group (triangles, solid line) and the control group (circles, broken line) are shown. The reference line indicates a value of 12.2 μmol, the maximum dose of methacholine administered during the challenges. Values above this line were calculated by extrapolation. The exclusion of data for occasions when methacholine challenge tests could not be performed because of low lung function potentially could have biased this analysis of change in AHR. In a sensitivity analysis the change in PD20FEV1 was re-calculated with PD20FEV1 assigned to a value of 0.1 μmol (equivalent to severe AHR) for those occasions when a challenge was not performed because the pre-test FEV1 was <60% predicted. The findings of this sensitivity analysis were similar to those of the primary analysis. This analysis showed that, at the end of treatment, the improvement in AHR was 1.9 doubling doses greater in the yoga intervention group than in the control group (95% CI 0.7 to 3.4, p=0.004). At the end of the 2 month follow up period the improvement in AHR, estimated in this sensitivity analysis, was 1.2 doubling doses greater in the yoga intervention group than in the control group (95% CI –0.4 to 2.8, p=0.1). The improvement in AQLQ score at the end of the treatment period was 0.41 units greater in the yoga group than in the control group. This difference just failed to reach statistical significance (p=0.07). There was no between group difference in the change in AQLQ scores 2 months after the intervention was completed (table 4). There was no difference between the two groups in the CAS either at the end of the treatment period or at the 2 month follow up assessment. Examination of the subscale scores from the AQLQ reveals that the major impact of yoga was on the “mood” subscale (fig 2). At the end of treatment there was significantly greater improvement in this subscale in the yoga group than in the control group. A slightly lesser difference, which just failed to reach statistical significance, was still evident 2 months after the end of treatment. The “breathlessness” subscale tended to reflect greater benefits from the yoga intervention than the “social” or “concerns” subscales. 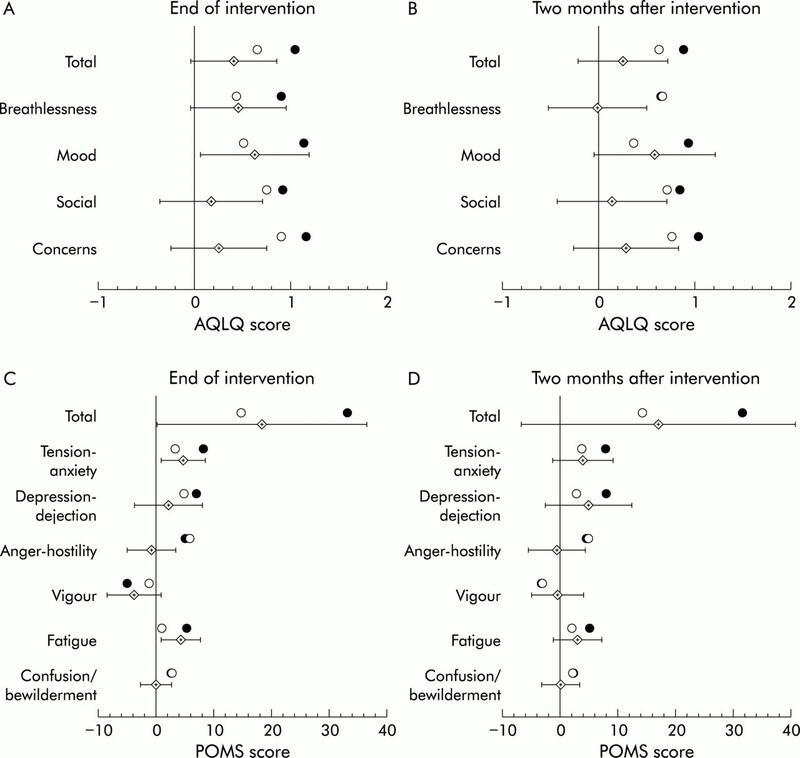 (A), (B) Changes in Asthma Quality of Life Questionnaire score (AQLQ) and (C), (D) Profile of Moods States (POMS) at the end of the intervention (A and C) and 2 months after the end of the intervention (B and D) in the yoga group (filled circles) and the control group (open circles). The diamond indicates the mean difference between the two groups (change in yoga group – change in control group) and the error bars represent the 95% confidence interval around the mean difference. A positive change in the AQLQ score indicates an improvement in quality of life. A positive change in the POMS component scores indicates a reduction in the attribute (that is, an improvement in all scales except vigour). A positive change in the total POMS score indicates an improvement in mood. At the end of the intervention period the yoga group had greater beneficial changes in POMS tension and fatigue scales and in the summary mood measure than the control group (fig 2). However, at the follow up examination, although there were similar trends in these scales, the differences were no longer significant. There were no significant changes in lung function as measured by spirometric tests during clinic visits or as measured by peak flow at home (table 4). Sahaja yoga improved AHR and some aspects of impairment of AQLQ and mood in patients with asthma who had remained symptomatic despite treatment with moderate to high dose inhaled steroids for at least 6 weeks. The benefits of yoga on these outcomes were greater than the benefits of relaxation alone. The magnitude of the beneficial change in AHR due to the yoga intervention in this study was approximately equivalent to that attributed to inhaled corticosteroids in patients with asthma in previous studies.17 However, these improvements were not accompanied by changes in lung function or symptoms recorded by diary card and appeared to wane over a period of 2 months after the intervention ceases. It is important to note that the role of yoga was assessed as an adjunctive treatment. All subjects had been taking the equivalent of beclomethasone 1500 μg /day for at least 6 weeks before randomisation and they continued on this treatment throughout the intervention and follow up period. Hence, the benefits of yoga are additional to the benefits of inhaled steroids. We have not tested the role of yoga as a replacement for inhaled steroids and cannot deduce whether the beneficial effects of yoga require the simultaneous use of inhaled steroids. One of the strengths of this study is the use of a plausible control intervention. The relatively good adherence to the intervention by the control group participants is evidence of our success in blinding participants to the active versus control status of the alternative intervention groups. Unexpected substantial improvements in symptom scores and quality of life in the control group, presumably due to non-specific effects of both interventions and the trial itself, may have limited our ability to detect further benefits which were specific to the Sahaja yoga intervention. There was a larger than expected loss to follow up in yoga treatment group. The availability of outcome data on only 21 subjects in this group was less than the 25 estimated in the sample size calculations. This left the study slightly underpowered and, hence, the failure to detect a significant treatment effect on AQLQ (Total) score may be a type II error. The higher than expected dropout rate in the yoga treatment group does introduce a potential problem with bias due to selective withdrawal of subjects who were not benefiting from the intervention. However, most of these withdrawals occurred soon after randomisation and are therefore unlikely to be related to the effectiveness of the intervention. Among those who did reach the end of treatment assessment, compliance with the yoga and control treatments was good. Most subjects attended most of the sessions. However, we do not have any quantitative data on adherence to yoga practices between the actual sessions or during the post-intervention follow up period. We have anecdotal evidence to suggest that there was poor maintenance of meditation practices after the end of the intervention period. It is likely that this explains the lack of efficacy at the follow up assessment. The findings reported here lend some support to the conclusions of a previous small randomised controlled trial of the effectiveness of Sahaja yoga in the management of asthma in adult women.7 In nine patients randomised to the intervention group the FEV1/FVC ratio increased from 48% at baseline to 66% at the conclusion of the 4 month intervention period. Over the same period the spirometric ratio did not change in nine control subjects (p<0.001). Subjects in the intervention group had an average of 5.8 “acute attacks” during the treatment period compared with 12.9 “acute attacks” over the same period in the controls (p<0.001). Meditation is designed to help the individual develop a state of mind which is positive or benevolent towards oneself and others. The ideal state of mind has been described as “Sahaja”, meaning spontaneous or effortless. The experience of meditation is essentially the Sahaja state. The yogic tradition encourages aspirants to pursue the awakening of an energy, traditionally known as “kundalini”, that facilitates the achievement of the Sahaja state. The meditative experience is characterised by a sensation of normal, or even heightened, alertness in conjunction with a state of complete mental silence. This is associated with a sense of relaxation and positive mood and a feeling of benevolence towards oneself and others. Meditation by the Sahaja yoga technique is, according to tradition, an innately therapeutic process which is beneficial for all chronic diseases, mental or physical, including asthma. There are alternative explanations for the observed benefit. Many yoga and meditation practices include exercises designed to alter the pattern of breathing. Subjects in this study were given no explicit instructions about controlling their breathing pattern and we did not measure ventilation. However, previous studies have shown that tidal volume and frequency may be reduced during and following a period of meditation.20,21 Mild hypoventilation has a number of physiological consequences which could have affected our results. Proponents of the Buteyko breathing technique claim that asthma is associated with chronic hyperventilation and consequent hypocapnia, and propose that exercises which reduce minute ventilation are likely to be beneficial.22 In the only published controlled trial of the Buteyko breathing technique5 asthmatics receiving active treatment had significant reductions in β2 agonist use, suggesting that the breathing exercises reduced asthma symptoms. However, the breathing exercises had no effect on end tidal carbon dioxide pressure, suggesting that the mechanism of the effect is unlikely to be via a reduction in hypocapnia. An alternative hypothesis may be that altering the pattern of breathing alters AHR by a direct effect on the dynamics of airway smooth muscle. Recent observations have led to the suggestion that the shortening velocity of airway smooth muscle may be an important determinant of AHR.23,24 In addition, there is in vitro evidence which suggests that airway smooth muscle shortening velocity may be affected directly by the volume of tidal breathing.25 In this model, decreasing tidal volume decreases the amplitude of force fluctuations acting on the smooth muscle and leads to reductions in actin-myosin crossbridge cycling rates and shortening velocity of the muscle, with a subsequent reduction in the amount of airway narrowing for a given stimulus. This model has not been tested in humans but provides a plausible explanation whereby changes in breathing pattern might alter AHR. In conclusion, this randomised controlled trial has shown that, in patients who express an interest in non-pharmacological treatments for asthma, the practice of Sahaja yoga does have limited beneficial effects on some objective and subjective measures of the impact of asthma. Potential explanations include an effect on the flow of “vital energy” according to the traditional yogic system or an effect on airway smooth muscle dynamics. While many will be sceptical of the yogic explanation for these observations, it is possible that further study of the effect of yogic meditation practices and altered breathing patterns in subjects with asthma may elucidate new non-pharmacological strategies to assist in the control of the manifestations of this condition. The authors gratefully acknowledge the assistance of Greg Turek, Peter Aerfeldt, Andrew Jones, Jelena Lemaic, Anne Stuckey, and Alyson Roberts in conducting this study. Groen J. The psychosomatic theory of bronchial asthma. Psychother Psychosom1979;31:38–48. Jones N, Kinsman R, Dirks J, et al. Psychological contributions to chronicity in asthma: patient response styles influencing medical treatment and its outcome. Med Care1979;17:1103–18. Ewer T, Stewart D. Improvement in bronchial hyper-responsiveness in patients with moderate asthma after treatment with a hypnotic technique: a randomised controlled trial. BMJ1986;293:1129–32. Lehrer P, Hochron S, Mayne T, et al. Relaxation and music therapies for asthma among patients prestabilized on asthma medication. J Behav Med1994;17:1–24. Singh V, Wisniewski A, Britton J, et al. Effect of yoga breathing exercises (pranayama) on airway reactivity in subjects with asthma. Lancet1990;335:1381–3. Rai U, Wells B. Role of Sahaja yoga in asthma. In: XVI World Congress on diseases of the chest. Boston: 1989. Woolcock A, Lundback B, Ringdal N, et al. Comparison of addition of salmeterol to inhaled steroids with doubling of the dose of inhaled steroids. Am J Respir Crit Care Med1996;153:1481–8. Horwitz R, McGill K, Busse K. The role of leukotriene receptor modifiers in the treatment of asthma. Am J Respir Crit Care Med1998;157:1363–71. Reddel H, Trevillion L, Salome C, et al. A scoring system for mild to severe asthma. Aust NZ J Med1995;25:423. Browne WJ. Learning to unwind. A workbook on relaxation and stress mangement techniques. Sydney: Health Media and Education Centre, 1984. McNair D, Lorr M, Droppleman L. POMS Manual - Profile Of Mood States. San Diego, CA: EdITS/Educational and Industrial Testing Service, 1992. Quanjer P, Tammeling G, Cotes J, et al. Lung volumes and forced ventilatory flows. Eur Respir J1993;6(suppl):5–40. Yan K, Salome C, Woolcock A. Rapid method for measurement of bronchial responsiveness. Thorax1983;38:760–5. Marks G, Dunn S, Woolcock A. An evaluation of an asthma quality of life questionnaire as a measure of change in adults with asthma. J Clin Epidemiol1993;46:1103–11. Haahtela T, Jarvinen M, Kava T, et al. Comparison of a β2 agonist, terbutaline, with an inhaled corticosteroid, budesonide, in newly detected asthma. N Engl J Med1991;325:388–92. Ernst E. Breathing techniques: adjunctive treatment modalities for asthma? A systematic review. Eur Respir J2000;15:969–72. Sudsuang R, Chentanez V, Veluvan K. Effect of Buddhist meditation on serum cortisol and total protein levels, blood pressure, pulse rate, lung volume and reaction time. Physiol Behav1991;50:543–8. Kesterson J, Clinch N. Metabolic rate, respiratory exchange ratio and apneas during meditation. Am J Physiol1989;256:632–8. Stalmatski A. Freedom from asthma: Buteyko's revolutionary treatment. London: KyleCathie Ltd, 1997. Solway J, Fredberg J. Perhaps airway smooth muscle dysfunction contributes to asthmatic bronchial hyperresponsiveness after all. Am J Respir Cell Mol Biol1997;17:144–6. Duguet A, Biyah K, Minshall E, et al. Bronchial responsiveness among inbred mouse strains. Am J Respir Crit Care Med2000;161:839–48. Fredberg J, Inouye D, Mijailovich S, et al. Perturbed equilibrium of myosin binding in airway smooth muscle and its implication in bronchospasm. Am J Respir Crit Care Med1999;159:959–67. Support: Royal Australasian College of General Practitioners (Trainee Scholarship and Research Fund).